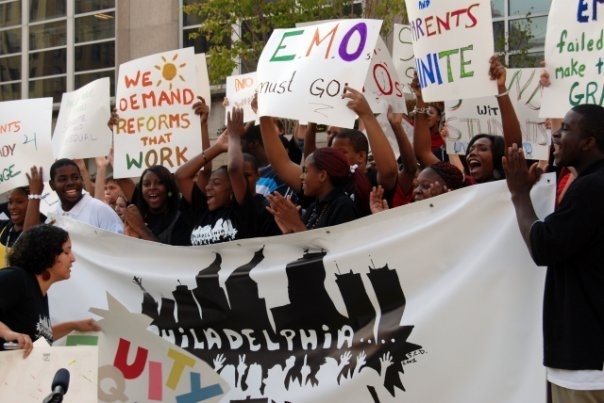 Since 1995 the Philadelphia Student Union has organized campaigns on issues ranging from textbooks to schools safety. Read about some of our past victories. 2001: PSU played leading role in limiting efforts to hand over the School District of Philadelphia to the for-profit Edison Learning (formerly Edison Schools) and other providers. Our efforts in collaboration with others, which included takeovers of the Mayor’s office and the school district building, resulted in stopping the privatization of the central administration and any high schools, gaining a second mayoral appointee on the School Reform Commission, and limiting the overall number of schools turned over to for-profit companies. 2002-03 school year: PSU influenced the school district to double the number of counselors in Philadelphia public high schools. The number of counselors increased from 114 to 228, a $9.5 million dollar expenditure. 2003-2004: PSU organized to design and implement a new Student Success Center (SSC) program. SSC’s are a one-stop-shop for college, career and social and emotional supports for students. SSC’s were implemented in 10 high schools, and the SSC model has been replicated in New York City and elsewhere. 2004-2007: Teacher Quality/Equity:In 2004, we wanted to call attention to the inequitable distribution of qualified and experienced teachers throughout the district. Based on school based surveys and the real experiences of our members, we decided to collaborate with the Education First Compact to come up with a Teacher Quality/Equity Platform. We also held a public hearing at City Council in hat was presided over by Chaka Fattah. We organized to build support for teacher incentive grants, which are pots of money that hard-to-staff schools could use for a number of incentives to attract and retain qualified and experienced teachers. We believe that it is the responsibility of the District, the PFT, and state, and the city, to make sure that teachers have the support they need to go to the schools that need them the most. Using surveys of teachers from hard to staff as well as easier to staff schools, we engaged in creative actions, testimony at the SRC, and created a student-produced video to call attention to this issue. 2008-2010: PSU members represented students in the Teaching Effectiveness Campaign, held public actions, got 500 postcards signed (as part of a larger mobilization) calling on the mayor, the district, and the PFT to keep the needs of young people front and center in contract negotiations. The victories we saw in the contract were the implementation of site selection in all high needs schools and stronger coaching and supports for new teachers. 2007-2010: PSU worked with West Philadelphia school leadership to support the implementation of Restorative Practices resulting in a 70% decrease in violent incidents over those three years. PSU also supported other structures aimed at increasing personalization such as breaking the school down into smaller learning communities based on student surveys. 2008-2009 : PSU was the major youth voice in a historic campaign that resulted in a new education funding formula for the state of PA. PSU played a major role in scheduling and attending legislative visits, staging public actions, having a vocal media presence on the issue, testifying for the state education committee, and educating and mobilizing students outside of Philadelphia. April 2009: PSU members at Sayre won the right to be involved in training their School Police Officers, and created and implemented the first student-led model to build communication, trust, and political understanding between students and school police in the nation. This process of training their 8 officers went so well that it resulted in further opportunities for PSU leaders to be involved in citywide training of School Police Officers in the subsequent two years. 2010-2011: school year PSU developed a formal partnership with the Office of School Safety to build student leadership to engage school police in two neighborhood high schools with significant climate challenges. Citywide student trainings of over 50 school police officers yielded the following results: 85% of officers agreed that the workshop increased their understanding of young people; 85% said the workshop will have a positive impact on how they interact with young people; 92% agreed that the workshop will help them reduce negative stereotypes about young people. 2009-2010: Dr. Ackerman, Philadelphia Schools Superintendent, expanded Student Success Center to all high-needs high schools in the city. 2008-Present: PSU became a founding member of the Alliance for Educational Justice, a national alliance of youth and parent organizing groups working on the national level to impact federal educational policy. 2009: PSU members conceived of and built the Campaign for Nonviolent Schools (CNS). CNS is a now a city-wide collaborative effort with 10 youth leadership organizations aimed at improving school climate and safety without pushing students into the criminal justice system. 2010-2012: Furness high school PSU members worked collaboratively with the principal to improve student attendance and climate. Attendance went up 5% in one year; there was a 50% reduction in serious incidents; a 30-point increase in math proficiency and a 10-point increase in reading proficiency. 2010-Present: After violence at South Philadelphia High School directed at Asian immigrant students in December 2009, PSU was invited to work with students at South to build leadership capable of engaging in cross-cultural understanding work. PSU was instrumental in leading monthly meetings between Black and White (American-born) students and Asian immigrant students (some Mandarin and Vietnamese speaking) at South Philly High, building relationships across racial and language lines and addressing common concerns. This had never happened before in the history of the school.As a result of the collaborative work in South Philly, we’ve noticed a better overall school climate, and in fall 2012, South Philly HS was removed from the persistently dangerous schools list.